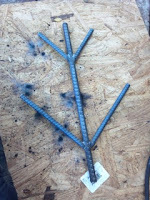 For many years I have fantasized about the idea of designing a Christmas tree fabricated entirely out of rebar. Off and on I would try to produce a rendering of the imagined tree, but it wasn’t until I hit upon the idea of drawing out each tier as though viewed from above that my ideas actually coalesced. My first design was severely symmetrical, but looking at the drawings I realized that balanced asymmetry (the so-called “occult balance” espoused by Frank Alva Parsons at his famous design school), would more closely mimic a real tree. Meeting a talented and accommodating young welder and craftsman gave me the final impetus for creating my vision. Though I can do many things, welding is not among them, so having a collaborator who understood my concept was a godsend. I told him that above all I did not want the tree to look “cute” or artsy, and I must say he got it in one. 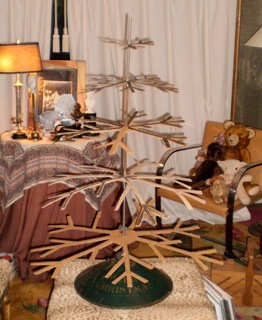 As a first step I mocked up a tree using sheets of heavy cardboard, cut into the outline of branches and stacked on a threaded rod. This wobbly construction I took to my welder, and he copied it brilliantly, the results far exceeding my wildest expectations. His suggestion to use three different weights of rebar for the trunk to mimic the taper of a real tree was a subtle but telling detail of his work. When I saw the finished tree it was so elegant I almost hated to decorate it! 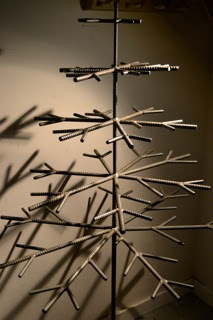 The silhouette cast such remarkable shadows on the wall, and the silhouette really did mimic my beloved silvertips, so much so that I christened it Abies rebar Magnifica, and claimed it a newly discovered species found growing in the urban forest. As part of my fantasy, I had over time assembled a small collection of industrial detritus—orphaned metal parts from another age of the world. To the same end, I also acquired bits of bent wire picked up on the roadside, and bought random lengths of old chain, because they reminded me of nothing so much as industrial versions of the paper chains we all made as children. Even though the tree was designed to mimic a silvertip, it eventually dawned on me that the entire concept was actually more abstract than figurative—rather in the manner of the Cubist-inspired metal “trees” in the German pavilion at the 1925 Paris Expo. When I began to assemble my bits of cast-off metal into “ornaments”, I also realized that some of my attempts were just too studied. 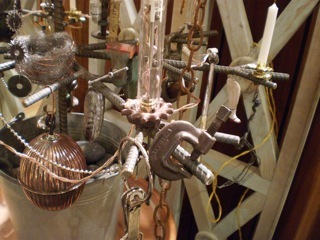 Not surprisingly, rings of skeleton keys, old bronze locks, and discarded spark plugs were all naturals, perfect "as found", while the most effective assembled ornaments had an offhand quality to them. With the exception of a single length of rusty chain, all the metal pieces were detailed by being buffed on the wheel and then paste waxed. 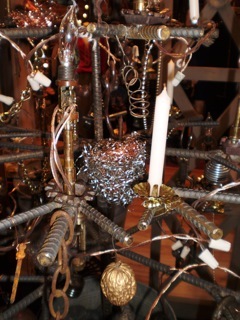 This made them gleam, and gave life and sparkle to the otherwise muted palate of steel and brass and iron. Among the few “figurative” things decorating the tree were candles, both electric ones with flickering bubs (these had vintage plumber's "putty cups" as bobeche) and old-fashioned Christmas candles in gilt tin clips. I also added a few gilded walnuts, always a nice old fashioned touch. My welder asked me if I were going to hang the traditional pickle on the tree, which up until then had actually not occurred to me. Since the tradition of the pickle is one I dearly love, I found some artificial pickles and painted them to look like metal—graphite and aluminum and gold—and hid them in the branches. One of my signatures is that every tree I decorate contains at least one bird’s nest. This of course stems from the old German custom of putting a nest in one’s Christmas tree to bring good luck in the coming year. In a moment of inspiration I realized that industrious little industrial birds would no doubt have made their nests of metal, so I took different weights of steel wool (OOOO to line the nests instead of down, naturally) as well as copper and stainless steel scrubbing pads, and made my own. I thought the results were quite hilarious and decided they were both elegant and witty—two of my very favorite attributes. In the end I felt the tree in its entirety qualified as elegant and witty, and I was as happy with the final result as it is mortally possible to be. I actually had so much fun decorating for my imagined Industrial Christmas that it made me feel like a kid again, filled with that sense of wonder and delight that is one of the most endearing and enviable qualities children possess. Indeed, the entire experience had a delicious sense of play to it that we as adults—even those of us lucky enough to be engaged in creative work—rarely get to experience!